Unlike some books that give you concrete, step by step advice, this is just as the title says....it's the inner game. Gallway observed students of tennis improved more when he stopped telling them what to do and asked them to observe specific things. You have to put on a new pair of glasses so to speak. You step away from worries about performance and put on curiosity, asking yourself new questions about what you are doing. I am not yet through, but reading with a highlighter so I can review it more quickly in subsequent readings, which I would think will be necessary as we tend to slip back to old habits. And not just us. Many athletes and world class performers lose their edge and succumb to pressures about performance. But if we adopt different mindsets, we can get back into the flow where things happen easily and without thought. I admit have not read the author's classic, The Inner Game of Tennis. Instead, I chose to order TIGOW because I thought the groundbreaking concepts in TIGOT would not only be repeated in the former but that the former would reflect the author's evolving understanding of inner games. After all, many years had gone by since the publication of the later. Having completed TIGOW, I have no reason to believe that I was wrong. Anyway, TIGOW is excellent. Reading it will almost certainly help your inner game. I have nothing to add to what other people have said about the book. Except that the story the author relates concerning the class he took as a Havard undergrad featuring then professor B.F. Skinner demonstrating the power of operant conditioning on a pigeon subject has stayed with me. That story alone might be worth the price of the book for those who understand much of its chilling and not-so-chilling implications. As someone who coaches leaders in a Fortune 500 company, I've found this book helpful in numerous ways and have been able to help others implement things presented in this book. 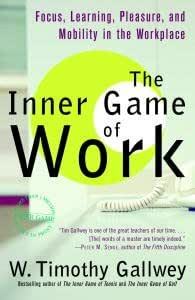 Gallwey's insights on "Voice 1" and "Voice 2" are important for understanding how we lose focus and for determining how to regain focus, and Gallwey also explains how the culture around us in our workplaces may interfere with or support our ability to focus. Elements of mindfulness and how to be aware without being self-judgmental are also presented here in ways that make sense and can be put into practice. I really enjoyed this book. I have a feeling it will take me years to fully appreciate the deep lessons it imparts, even though understanding them was easy. I also liked The Inner Game of Tennis, but this one was more applicable to more people, since so many people work. It isn't full of answers or neat prescriptions, nor claim that it's just a matter of following a patented formula. This book offers tools, ways of finding answers more quickly. Highly recommended for anyone seeking the deeper meaning behind work, which is a worthy pursuit, since it is the single activity we spend the most time doing. In my top 50 (business, productivity). Wonderful overview of the dialogue between the ears. It also discusses how our environment influences us negatively when we're unaware and not focused. The concept of mobility and the analogy of being behind the wheel of a car actually directing our careers was excellent!